Celebrate Mom with Spring Must-Haves from Hallmark! Spring is here. Easter is right around the corner. And before you know it, we will be celebrating Moms around the world on Mother’s Day. If you are looking for something special to gift to your Mom, or the woman in your life you has inspired and cared for you, take a look at all the spring must-haves from Hallmark. Mother’s Day is the third-largest card-sending occasion. Over nine million Mother’s Day cards will be given this year. Hallmark offers over 1,000 different designs, making it easy to find the card that will say “I love you” in your own special way. The observance of Mother’s Day became official in 1914. Hallmark has been producing cards for this holiday since the early 1920s. Anna M. Jarvis, born in 1864 in Webster, Virginia, is credited as the force behind Mother’s Day. When Jarvis was 41, her mother died. On the second anniversary of her mother’s death (the second Sunday in May, 1908), Jarvis made public her plans to establish a day to honour mothers. Hallmark not only has great gift items for your Mom like picture frames, jewelry trees, candle holders, scarves and books, they are also your one stop shop for fun Easter decor and Graduation gifts as well! 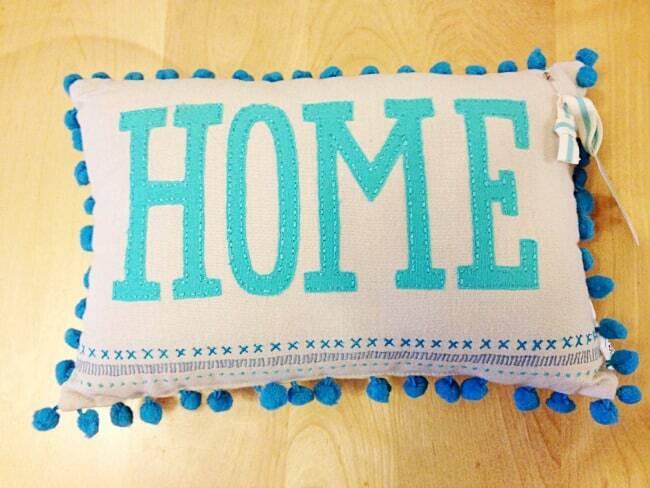 1 CANADIAN Mommy Moment reader will WIN a HOME decor pillow from Hallmark. To enter, leave a blog post comment telling us who you would gift this to. I’d give it to my sister, who will be moving soon. I’d keep it, it’s way too cute! I’d give this to my niece, it would co-ordinate well with her decor. I would keep the pillow for myself and I would split the rest between my mother and mother in law. I would definitely give to my mom! I would gift this to my mother, she deserves it and plus it’s always hard to buy for her!! I would give this to my mother. She would be very happy! To my mother for mothers day! It would look nice in her living room. I would gift it to my grandmother! I would definitely gift this to my Mom. She gave me such a wonderful childhood, Love you mom! am i allowed to say i would give this pillow to… me? I think it is really sweet and i haven’t given myself anything in ages! thanks for the chance to win! I would give this beautiful pillow to my Mom!! I would give this to my daughter because she has such a nourishing home for her family – thank you! I would definitely gift this to my daughter and her girlfriend, who have just gotten an apartment together! I would gift the pillow to my mom for mothers day! I would gift this to my mother-in-law. It would be perfect for her place. I’d give this to my sister. She’d love it. My brother and his girl for their new apartment. I would gift this to my daughter who’s away at college, she often feels lonely and misses us. My mom-in-law would love this! I would give this to my beautiful girlfriend. I would gift this as a house warming gift. I would gift this to my daughter for her birthday in April. I would give this pillow to my mother. would give it to my daughter in law. Well since I don’t have a Mother to celebrate this with, I would keep it for myself as I’m a mom. This would be a fantastic present for your mum! Save it for my daughter who is going off to college soon!